Market direction: congestion to mildly down. Bounce up at first. 60mins: Up, but check levels carefully. Same as SPY, the 60mins chart having a 2 to 5 bars visibility like any other chart, we could not anticipate the afternoon bounce, even the support level was clearly identified. MTFS is not in its best shape, so there is no reason to believe it will go much higher. PR2 at 812.5 seems pretty strong right now. Daily: Congestion to down. Support level on 791 is so far holding. Despite yesterday's bounce, the picture is still bearish.We seem to have a Fib pattern forming, and 791 may not hold very long as MTFS and Entropy look more and more bearish now. One could therefore see RUT going lower to 781 (Fib + MM level). Entropy and MTFS indicate continuation of this situation of congestion with a slight downward bias. We can note that we are again very close to a key level at this time frame with the Swing indicator oscillating frequently. 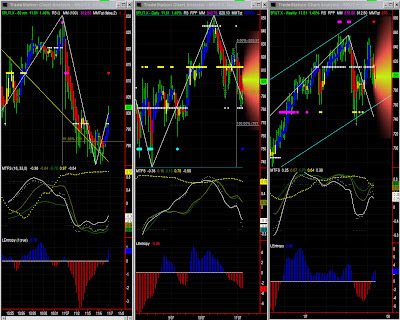 Market direction: Congestion with lower bias, but check levels and new pattern forming. 60mins: up, but MM & Fib levels to be checked. We were yesterday at a junction and it could have gone both ways. It seems the 150 level (MM + Fib) held well, so a bounce is in order for the time being. We'll have to pass 153 to possibly resume the up trend we had before. If so, the all time highs are the next target. Significance level is slowly coming down, indicating we'll have to pay more attention to lower time frames. Unlike the 60mins chart, the daily chart (almost as significant) shows a congestion with a lower bias. For the time being, MTFS is not very bearish, hence the lower to mid part of the [150-156] range is still valid. 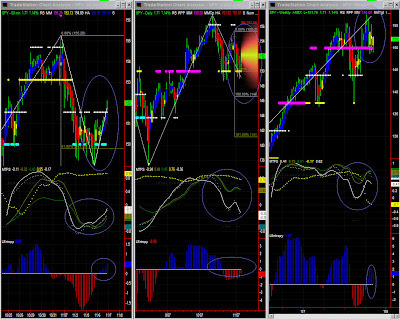 Weekly: probable congestion - Very low significance level, due to MTFS divergence. Entropy is looking OK but coming down, but MTFS indicates continuation of this situation of congestion with a slight upward bias. Watch for divergence and possible double-top.With such a low significance level, one should rather take cues from lower time frames. I anticipated some congestion before the bounce up, so the timing was not quite correct as it happened during the course of the day. Obviously, the 60mins chart provides visibility a few bars ahead, and dynamics can change during the course of the day (7 bars).The analysis remains about the same: MTFS and Entropy are both indicative of some upward bias (Energy is just picking up). It may provide some strength later on to reach 2250 (potential Fib pattern). Daily: Congestion to Up, slow down approaching strong resistance level. NDX should creep up to previous highs, albeit considerably slower in comparison to what we've seen in the last couple of months. The rise may stall, but certainly no strong retracement in sight. 2250 seems a reasonable target now. Entropy is still looking very good, but MTFS has difficulty adapting to such a strong run (U-shape pattern is not closing). It seems we're entering a period of congestion, at least compared to the seemingly unstoppable bull run we've had. 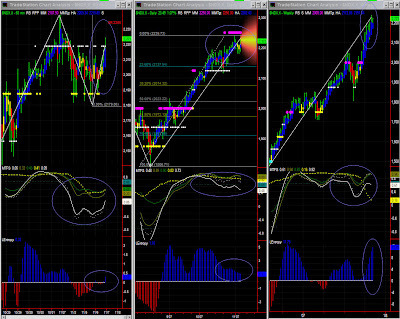 Looking at MTFS, no retracement in sight just yet, but we have to watch how this divergence develops. A peak in Entropy will also be an alert of a change in dynamics.